Due to prolonged immobility, medications or surgery, patients may be at risk for blood clotting. 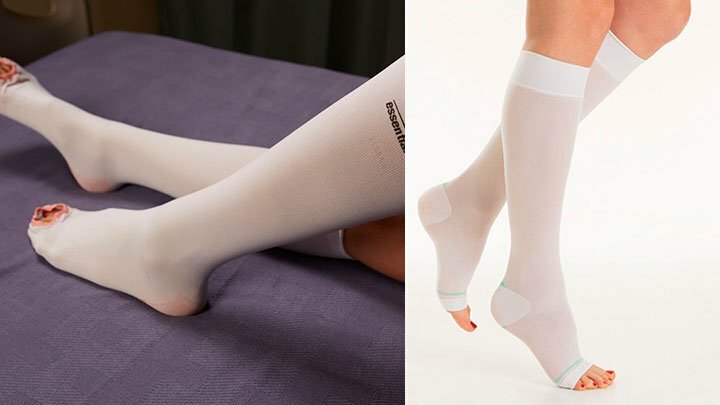 To prevent clotting in the deep veins and to ensure the normal functioning of lymph and veins of the leg, anti-embolism stockings (also known as TED hose) are applied. The application of anti-embolism stockings in a proper manner, is an imperative aspect of patient’s care. It can avert life-threatening complications from happening. To learn how to apply anti-embolism stockings in a correct manner, go through this article. Wash your hands following the procedure as discussed in ‘Hand Washing Skills”. After washing, wear the gloves. As you enter the patient’s room, greet him/her. Explain that what are you up to. It will trim down the fear and anxiety of the patient to a great extent and give him/her an opportunity to support you with the procedure. Ensure that the stockings are of the correct size for your patient. Anti-embolism stockings are made up of elastic and may worsen the situation, if the patient has latex allergy. Therefore, make sure that the patient is not having latex allergy. Help the patient in attaining supine position i.e. lying down on his/her back. In case, the patient is not feeling comfortable in this position, shift to another position to make him more comfortable. Before applying the anti-embolism stockings, ensure that the patient’s feet are dry (if not, apply talcum powder to make them dry). Put stockings on the patient’s foot, by gathering its fabric into your hands. Roll it upwards, until its upper edge reaches just above the patient’s knee. After completing this procedure, take out your gloves and dispose them. Wash your hands. The size of the stockings should be such that it fits the patient’s legs, properly. Stockings should be wrinkle-free; otherwise it may make the patient uncomfortable. While applying stockings, ensure that the blood circulation in every part of patient’s body is proper. From time to time, check the toes of the patient for signs of decreased circulation, like slow refill, discomfort or coldness. If the patient complains of loss of feeling in any part, numbness or tingling, report the same to the nurse immediately. To allow for proper circulation, remove anti-embolism stockings every 8 hours. Remove it on doctor’s order. For new CNAs, applying anti-embolism stockings may be a nerve wracking task. The common mistake, most of the students commit during demonstration of this skill, is that they pull the patient’s legs too hard or put too much pressure, while applying or taking off the stockings. You should use gentle force, while performing this skill. The experts suggest you not to feel bad, in case you face trouble in mastering this skill. Just purchase yourself a pair of stockings and practice at your home by applying it to friends and relatives. Try to pull the stockings wrinkle-free and overcome your weak points. Have a look at this video. It displays the correct way of applying the anti-embolism stockings.